More than just beer. It’s Craft Beer. Would you be willing to mess around with centuries of brewing history? Craft brewers are creating a new future for beer. Artisan or traditionally crafted varieties of beer, produced to deliver alternative flavours from multinational beer brands. ‘Boutique’ (or at least smaller) brewers who often incorporate unique ingredients and alternative brewing techniques to achieve individual flavour styles. You’ll have to try one to find out. Given that they’re all beer, the flavour varieties are as narrow – or as wide – as the brewers want them to be. Because of the focus on innovation, investment and personal (rather than mechanised) involvement in the brewing process, expect to pay a bit more for your craft beers. But for a taste sensation that’s beyond the everyday, it’s money well spent. Remember the term ‘micro brewery’? Small, independent breweries developing their own particular styles of beer, maybe based on olde worlde methods lost during modernisation, or focussing on new methods or flavours unique to the producers’ personal approach? Well basically that’s Craft Beer today. It’s all in the semantics, but the micro breweries or boutique beers of old now involve a more approachable attribute of skilled craftsmanship rather than the more marginalised ‘micro’ or ‘boutique’ sense of exclusivity. It all began in the UK and the US 40 or so years ago, when independent brewers started to rail against the cookie-cutter approach of multinational brands. Their objective was common although their methods were anything but; provide an alternative to the bland, same-same flavours of western lagers by producing artisan brews in limited quantities. Some of the early pioneers have fallen by the wayside, but their investment in the craft beer sector created a niche that paved the way for newer proponents to firmly plant their foot in the door of the global beer market and slowly prise it open. The explosion in popularity of craft beers is as much to do with our more sophisticated palates and discerning tastes as with our (actual or subliminal) political perspectives. Small scale, locally owned and using natural ingredients and techniques all suggest positive attributes – greener for the planet, healthier for the consumer and contributing to the local economy. But when sip comes to shove, it’s all about the flavour – no-one’s going to support a product that doesn’t taste great. So where are Australia’s craft beers produced? Pretty much everywhere is the very satisfying answer. Name a State or Territory and they’ve all got their own craft beer breweries, some just a little better known than others. One of Western Australia’s success stories is Matilda Bay Brewery. Starting life in 1984 in Fremantle, the brand has now expanded across the country and moved its headquarters to Melbourne. Some of its more interestingly titled brews – they’ve just gotta be Australian haven’t they? – include Redback Original, Beez Neez, Dogbolter and Fat Yak. Little Creatures is another WA success story, sharing a similar provenance to Matilda Bay. It started in 2001 in Fremantle, and has since expanded to Geelong on the success of its Little Creatures Pale Ale, Pilsner and IPA varieties. James Squire ales are brewed at The Malting Shovel in Sydney’s Camperdown. All beers are named after Australia’s first brewer, James Squire and involve references to his convict history. 150 Lashes Pale Ale, Chancer Golden Ale, Four Wives Pilsner, Stowaway India Pale Ale and Jack of Spades Porter are some of the most popular. Cascade Brewery is arguably one of Australia’s best known and certainly the oldest, founded in Tasmania in 1824. Cascade’s craft beers launched in the late 1980s, and include a Pale Ale, Lager, Blonde and Stout. It is unique in Australia (and rare in the world) in producing its own maltings from locally grown barley. Some of the best of the rest of Australia’s craft beers include White Rabbit craft brewery headquartered in Healesville, Victoria; Kosciuszko Pale Ale, brewed in the Snowy Mountains area of Jindabyne, NSW; and Vale Ale brewed by McLaren Vale Beer Company from Willunga in McLaren Vale, SA. We’re also pretty keen on Blue Moon and Sierra Nevada craft breweries. Both are from the US but couldn’t be more different. Blue Moon from Denver, Colorado, rose to fame in the mid ‘90s on the back of its Belgian-Style Wheat Ale, whilst Sierra Nevada started brewing as far back as 1980, launching their still-favourite American Stout. As craft beers go, they’re well established and making significant inroads in the US and international markets. Ah, well. This is where it gets tricky, indeed nigh on impossible to categorise – which of course is the beauty of craft beer. Each brewer strives for unique characteristics and flavours that make it stand apart from the crowd, and so by definition there is no one flavour for craft beer other than that they all taste of beer. It’s probably easier to separate craft beers into a few particular beer styles, including lager, ale and blonde. Craft lagers aren’t actually the most prevalent of craft beers as, due to their brewing process (top rather than bottom fermented) they don’t have quite as many taste variations and, as such, not quite as much interest to the artisan brewer. Generally they’re light in colour, crisply smooth and a little bit hoppy. Cloudy, blonde wheat beers are gaining popularity in Australia, and pack a hefty alcoholic punch. Brewed from wheat rather than barley, their predominant flavours are bread and citrus resulting in a smooth, slightly bitter flavour. 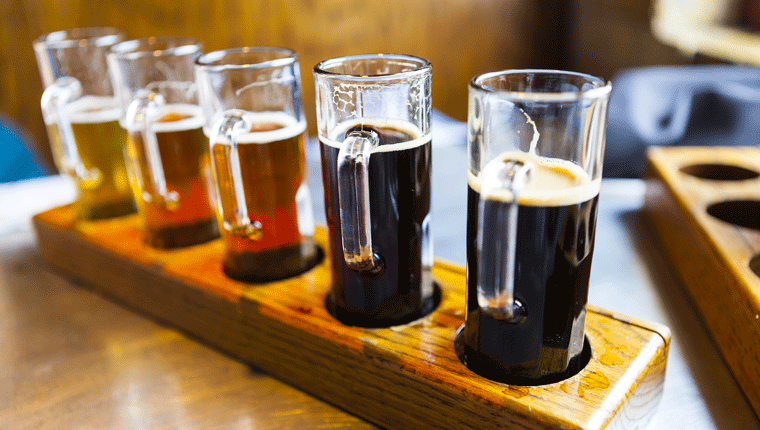 Ales are the most diverse in range and therefore the most widely produced style of craft beer. Pale ales, amber ales, porters, stouts all come under the generic heading of ‘ale’ and their flavours all vary considerably – and that’s not even taking into account different nuances from different breweries. In general, they offer a much more robust taste sensation. Stouts, for example often use grains that are roasted during the initial brewing process, providing a deeper colour and flavour to the resulting brew. Malt drives a lot of the body, with toffee and raisin notes softening the bitter palate. Pale ale flavours include malt, hops and yeast, honey, citrus and passionfruit or peach, and often fall into two varieties; Australia Pale Ale and India Pale Ale (or IPA). In general, the IPA provides some savoury notes, including aniseed, whilst the Pale Ale reflects more stone fruit flavour. Craft beer brewers deliberately set out to challenge the consumer’s palate. Once you start investigating just how far they’re willing to push the beer boundaries – perhaps an award-winning “White Chocolate and Raspberry Pilsner” sounds of interest, or maybe a “Maple Coffee Stout”? – you’ll realise that the future of craft beer is in good hands. And that you’d better start testing now.